A mandala represents an invitation to enter the Buddha's awakened mind. 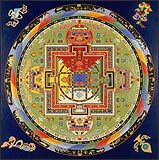 Tibetan Buddhists believe there is a seed of enlightenment in each person's mind that can be uncovered by visualizing and contemplating a mandala. The complex symbols and exquisite combination of primary colors are considered a pure expression of the principles of wisdom and compassion that underlie Tantric Buddhist philosophy. A mandala, or circle, is a representation of the Buddhist universe. These cosmograms represent in symbolic color, line, and geometric forms, all realms of existence and are used in Tantric meditation and initiation rites. The Yamantaka Mandala is a cosmic blueprint of the celestial palace of the deity Yamantaka, Conqueror of Death. Discover the symbolism and meaning of the Yamantaka Mandala.